Over 100 years after the birth of the Model T, Ford’s message still rings true: consumers often cannot explain – or even know – what they want. However, consumers almost always can tell you what they need. That concept applied in 1910 to personal transportation when consumers wanted faster and more convenient transportation, and it applies today to mobile content. Can’t most content simply be viewed on a mobile device? Mobile content can be quite similar to content consumed on computer screens (desktops and notebooks). The article you’re reading now, for example, can easily be created and read on either a computer or a smartphone. But the most powerful mobile content is typically highly engineered – and quite expensive to create. And take note: in late 2008, mobile web access exceeded desktop computer-based access for the first time, so every organization should consider if it needs a mobile web content strategy for its audiences. How do I know what kind of mobile content to create? What types of content would be most helpful to consume on your mobile device? Your survey may be more or less detailed; no cookie-cutter survey will work for all publishers and audiences. How should I create my online survey? For virtually every audience, the best way to gather this information is via a simple online survey. Online surveys are easy and inexpensive to create. In less than a week, you’ll have meaningful results that can drive your mobile content approach. Services such as Zoomerang and SurveyMonkey let you easily create a basic online survey for free – simply create an account and either start with a template or from scratch. Google Docs (Google account required) now also offers a survey component, and I like it because it integrates well with many web publishing services, lets you publish more complex question sets, and doesn’t add much in the way of graphic baggage. 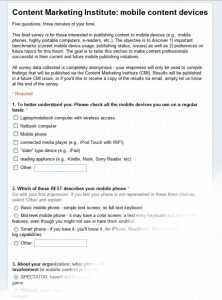 The best way to see one of these surveys in action is to look at the very bottom of this article. I’ve placed a link to a survey created exclusively for the CMI community. This survey took less than 30 minutes to transfer from a text document to a web form that’s ready for delivery via a link in an email or on a web page. Take a couple of minutes to answer five simple questions. All responses remain anonymous, and we’ll publish results in a future issue. Before you create what you believe is the coolest and best mobile content, remember that the mobile content that you should develop is what your audience really needs. After all, rather than just breeding a faster horse, your goal is to create a smarter, more powerful mobile content engine. Over 40 years ago, Jim O’Hare was hooked on cool communications gear when he spoke remotely to his friend next door - courtesy of two soup cans and some twine. Today, he stays current on leading-edge technologies used to effectively communicate stories for a wide range B2B and non- and not-for-profit client organizations in high-tech, bioscience, government and education sectors. O'Hare is the managing partner of BioMedia, LLC, a consultancy and production resource. Follow me on Twitter @ohiobio.